“I much prefer it to Carmen,” I heard the lady in front of me say as we left the auditorium. I think so, too. Of Bizet’s operas, I’m not entirely sure why Carmen is the most performed. It’s popular, certainly, but is that because it’s been foisted upon us with such regularity? That it’s the one that ‘defines’ opera for the general public and so draws a crowd when a crowd needs drawing? If, on the other hand, Carmen serves its purpose, that is to introduce an uninitiated audience into this marvellous, magical musical world, then hats off to it. Because what comes next as one delves (though, technically, earlier) from the man that composed it is, in my opinion, and in that of the elderly lady in front, the main course to Carmen’s appetiser…and I’ll tell you why. Story is, ultimately, immaterial in opera. You don’t go to the opera to be drawn into a compelling tale. More often than not, you know it before you go. More than that, it’s fantastical, frequently implausible, sometimes absurd and can feature more cross-dressing than a cruise ship cabaret. And often the story is compounded by the all-too-inappropriate casting. Parts in opera are cast for their voice, not necessarily their aesthetics. Case in point; I saw a production of Turandot where the lead soprano was, forgive me, not so pleasing to the eye and could have, ahem, lost a few pounds. This is to say I am neither fattist nor chauvinist but when the thrust of the story hangs on the idea that Turandot is supposed to be so stunning, so rapturous as to drive men to want to risk their lives in a contest to win her hand, then you really need someone who should look the part. Even the libretto in opera – the script, essentially – is too often hammy, fluffy and full of nonsensical semantics. In fairness, it is written around music so there’s hardly the opportunity for clever dialogue; it’s designed to drive the story. And we know where we stand with that. No, opera is about the music. For all the weaknesses of the narrative, the faults of the libretto and the misgivings of the casting, what makes opera work is the emotional buy-in that’s achieved when a beautiful aria gives you a lump in your throat, or a quartet that makes the hairs on the back of your neck stand up, or a rousing chorus makes you sit tall in your seat. With this in mind, I’m mystified why The Pearl Fishers is not performed more often – which, mercifully, Opera Holland Park have remedied – because in fact it hits every right note when it comes to story and musicality. It has a narrative that’s a little more compelling than most; love rivalries, of course, and with more than a few coincidences and conveniences in plot, naturally, but with some genuine heart-stopping moments. I’ll spare the detailed synopsis but, suffice to say, it’s set in a fishing village in Sri Lanka, at the start of the pearl fishing season – cue a fantastic overture – where two childhood friends, Zurga and Nadir, are reunited and recall the time they fell in love with the same woman, Leila – cue seminal tenor-baritone duet – but swore to remain loyal to each other rather than fight over her. Needless to say, Leila shows up, Nadir falls for her, Zurga finds out and, being the leader of the village, condemns them both to death. Gripping stuff, eh? I won’t go any further but suffice to say there is a touching redemptive conclusion. So is it the music? Well, the trouble is musically it’s often deemed inferior because of its simplicity, relying on one recurring theme. But, in fact, that is its strength. The melody from the male duet, ‘Au Fond du Temple Saint’, as it resurfaces throughout creates a moving reminder of the friendship that beats between the two male protagonists in the face of some of the more dramatic moments. Moreover, there are choruses that resonate and, as mentioned, a fantastic overture that throws you into the action – all the more so for Holland Park’s acoustics – and some genuine inventiveness in the score to convey the exotic setting, such as Nadir’s aria and Leila’s Act One incantation, as conductor Matthew Waldren points out, when Bizet surely had little or no experience of such distant influences to draw upon. When it is performed, often productions try to compensate for what are considered its simpler virtues by going bananas on the production design. Opera Holland Park’s production, their hand forced by the limited staging potential, turns this into its favour. In this instance, nothing a few ropes and sail cloths couldn’t sort out, and the use of candles at the end is particularly evocative once the lights go out. As Bizet’s opera divides opinion, so too does OHP’s simple, minimalist staging but what that does is ensure the music is centre stage. 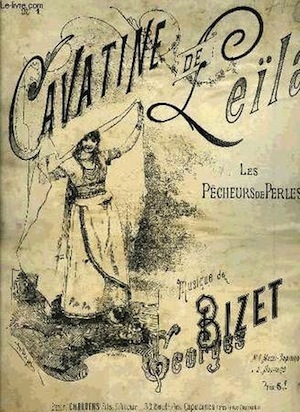 Receiving just 18 performances in its opening run in 1863, The Pearl Fishers has, in time, slunk into Carmen’s shadow, perhaps by Bizet’s own admission from his “slender” musical baggage – at which critics and companies alike seem to have been influenced – but, if given the chance to discover it, it proves a worthy, refreshing alternative to what I consider the overplayed staleness of its bigger sister. Thankfully, Opera Holland Park, in all their daring, boundary-pushing appreciation of the art form featured it in their 2013 season. And, if not by my admission, doesn’t that wise old lady in front of me know what she’s talking about after all. The Pearl Fishers, by Georges Bizet, ran for seven nights as part of Opera Holland Park’s 2013 season. Every performance was sold out. OHP’s 2013 season continues through to the end of August with Donizetti’s L’Elisir d’Amore, Wolf-Ferrari’s il Gioielli della Madonna and their new commission, Alice and Wonderland. For more information and to book tickets, visit the website.